The wall, originally uploaded by nobodaddy69. The Sungbo Eredo is a 1000 year old monument about 60 miles from Lagos, down the Lekki Expressway near Epe. 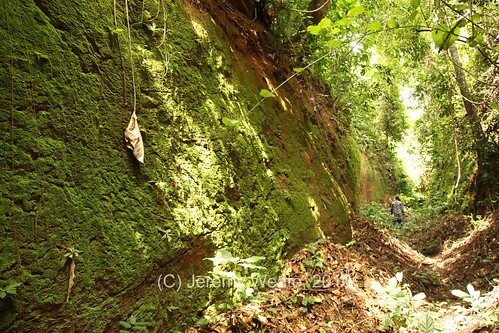 It is a 100 mile circular ditch/wall, thought to have been built around 1000 years ago, by "Bilikisu Eredo". Her grave/shrine is located in Ijebu Ife, which is part of the Sungbo Eredo. The locals think of Bilikisu as the Queen of Sheba (whose name was also Bilikisu). Given that the Queen of Sheba lived, according to the Bible and other sources, around 1000BC, there have been crossed wires in the oral legend at some intervening point. What is definitely true is that it took more effort to construct the Sungbo Eredo than it did to build the pyramids in Cairo. There were powerful women in Ijebu kingdom, capable of ordering tens of thousands of slaves to work over the decades it must have taken to build the monument. For more information on this wonderful/mystical/natural place, go here. I'm not quite sure Ogun State Government realises it has the equivalent of Stonehenge within its domain of governance, nor whether the government is aware that the site is facing the threat of disappearing in the next two decades due to erosion. It seems to me that the Sungbo Eredo is easily a candidate to be Nigeria's 3rd Unesco World Heritage site. But who cares, apart from the odd oyinbos who stray there every month or so? I'm not quite sure Ogun State Government realises it has the equivalent of Stonehenge within its domain of governance, nor whether the government is aware that the site is facing the threat of disappearing in the next two decades due to erosion. No, they don't care. Anything that would actually benefit the local region and the nation is not a priority. Lining their pockets is the only thing naija money is good for! "What is definitely true is that it took more effort to construct the Sungbo Eredo than it did to build the pyramids in Cairo." Simply on the basis of volumes moved this is not true - in pure energy terms maybe but then there is all the rock and stone work on the pyramids. It is not even a fair comparison - maybe better compared with some of the great canals in Europe at least some similarity in scale and type of structure.